Ever since Hollywood began producing moving pictures, the industry has promoted a stereotype of the Villain: he's the one dressed in black, wearing a black hat, riding a black horse. In the avian world, black birds often get saddled with the same bad rap. Consider the three pictured above. On the left, we have the large, black Turkey Vulture with a face only its mother could love. When a group of these scavengers are seen circling the sky, script writers are giving a visual clue to let viewers know that something has died. Then there is the ominous midnight black Raven, who is often associated with death and the underworld. And on the right is the leading man in our little drama of good versus evil: the Great-tailed Grackle, a loud, raucous blackbird with the reputation as a nest raider. So let's get on with our story. Spoiler alert: good prevails in the end. 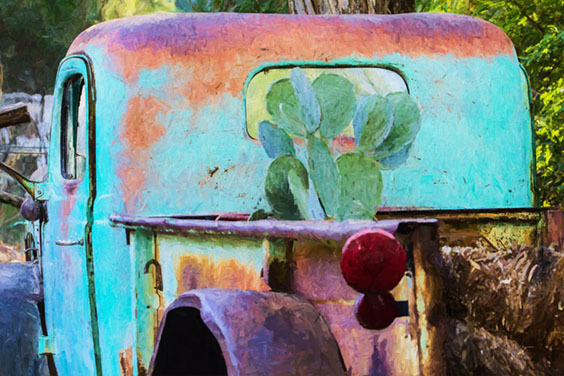 We begin with an adventure - as all good stories do - when my friend, Susan, suggested a trip around Phoenix and its surrounding suburbs to find and photograph exotic birds. 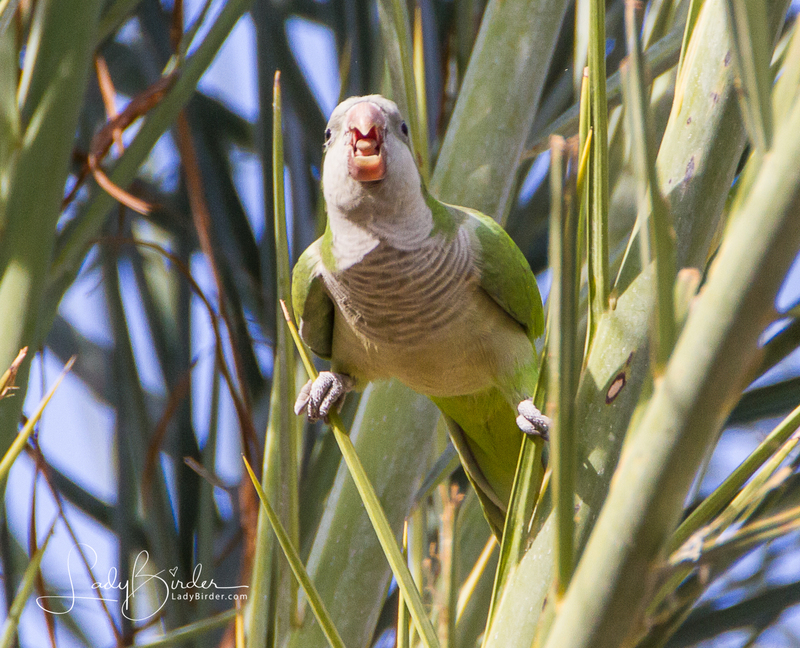 Our targets were the Egyptian Goose, Rosey-faced Lovebird, Yellow-collared Lovebird, Nanday Parakeet and Monk Parakeet, all escapees from zoos, international pet traders or careless owners and some of which have established colonies around the Phoenix area. Our search started early and by midday we had found three out of five target birds. Out next stop: Gilbert Town Square, where we were in search of a feral colony of Monk Parakeets, also known as Quaker Parrots, that have established a nest near the entrance to a shopping mall. 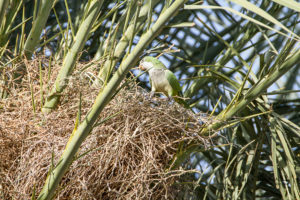 We spotted the large nest shortly after arrival high in a palm tree in the middle of a busy island and it wasn't long before we saw a pair of noisy, bright-green and blue birds racing through the tree tops. Our Heroes. 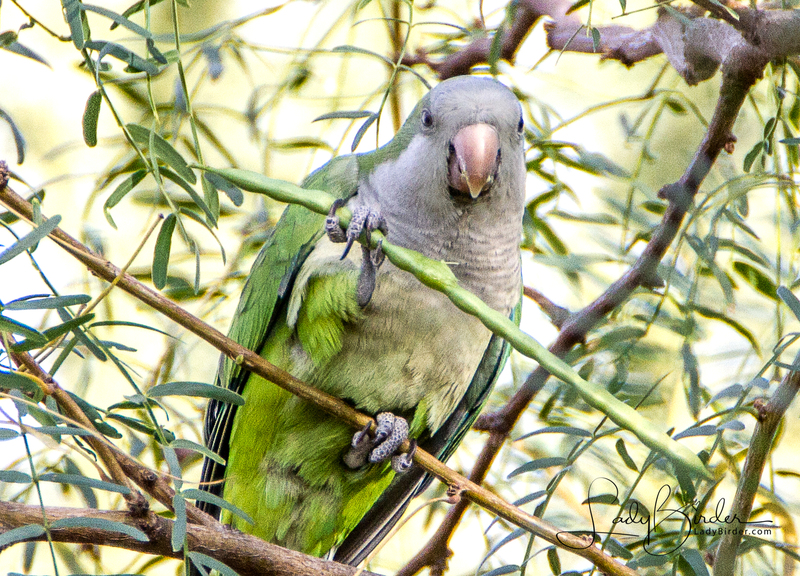 Monk Parakeets are native to South America and the most widespread of American exotics. Urban legend has it that they broke out of a shipping crate at JFK Airport in New York in the 1970s and have been spreading around the country ever since. 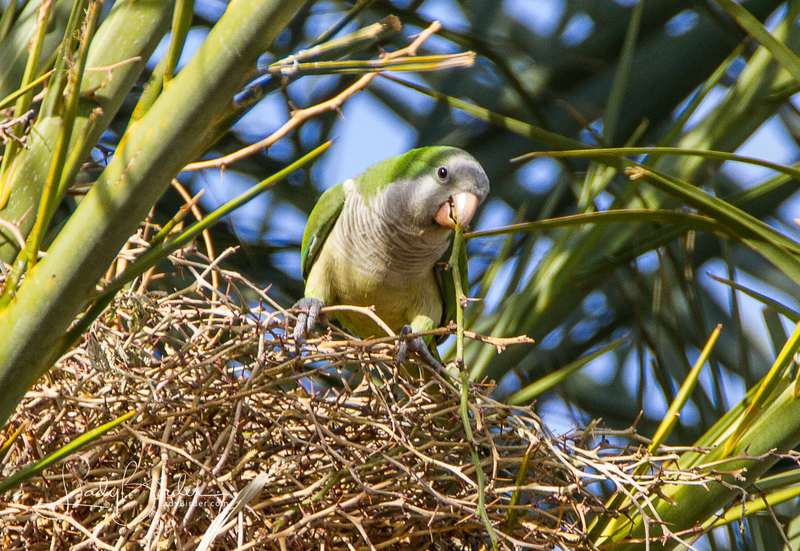 They are the only parrots to nest communally; dozens live together year-round in large, multifamily stick nests, which may be one reason they have managed to survive the cold winters in adopted cities as far north as Chicago and New York. As our drama unfolds, the active birds chatter endlessly to each other with a vocabulary that consists of at least eleven types of calls. 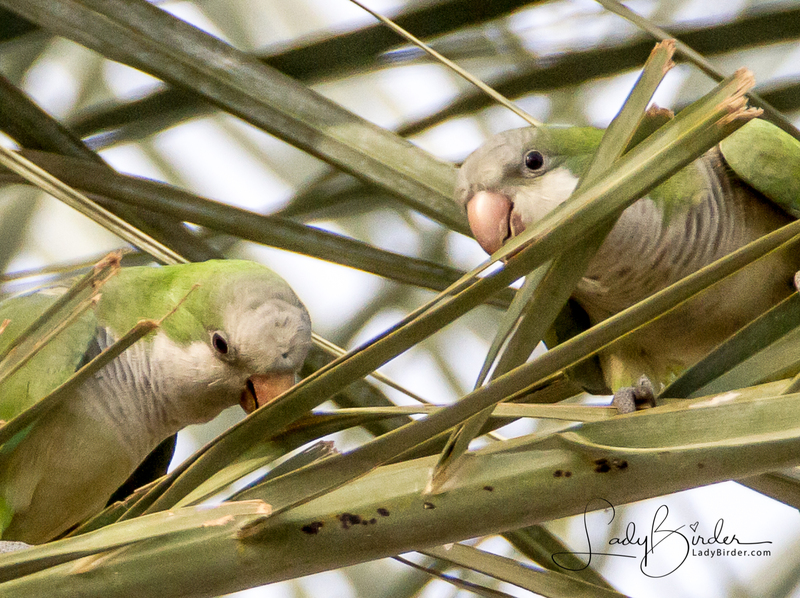 As they talk, they are busy stripping bits of leaves from the palms that hold their nest and snapping off small sticks from nearby mesquite trees with their beaks. The thorny mesquite twigs are a smart choice of building material. They help to hold the nest together and protect it from predators. The pair is working on their own condo within the large structure by fashioning the floor, then building sides and a roof to enclose a round space with a tunnel that leads to the outside. Nests can be very large (more than five feet across), weigh a ton or more and are continually added to for years. Suddenly, the happy cacophony of squawks and chirps becomes an alarm signal as one of the birds notices an intruder. Enter our Villain: The Great-tailed Grackle. Were eggs in the nest already? Did the Villain mean harm to the pair? Or was he just playing the schoolyard bully? The Parakeets weren't waiting for an explanation. 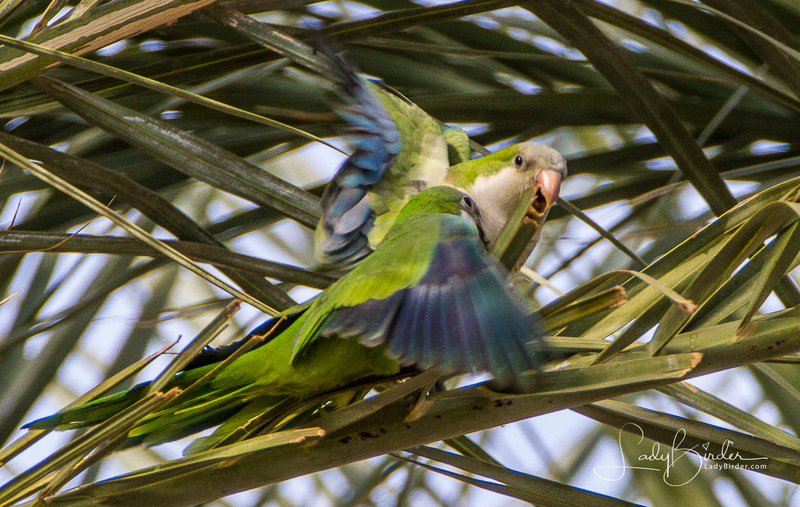 In a blur of blue and green feathers and blood curdling battle cries, the dynamic duo dive-bomb the marauder, finally driving him from the tree and away from the nest. Even the Parakeets seem surprised at their victory. "Is he gone?" they seem to whisper to one another. 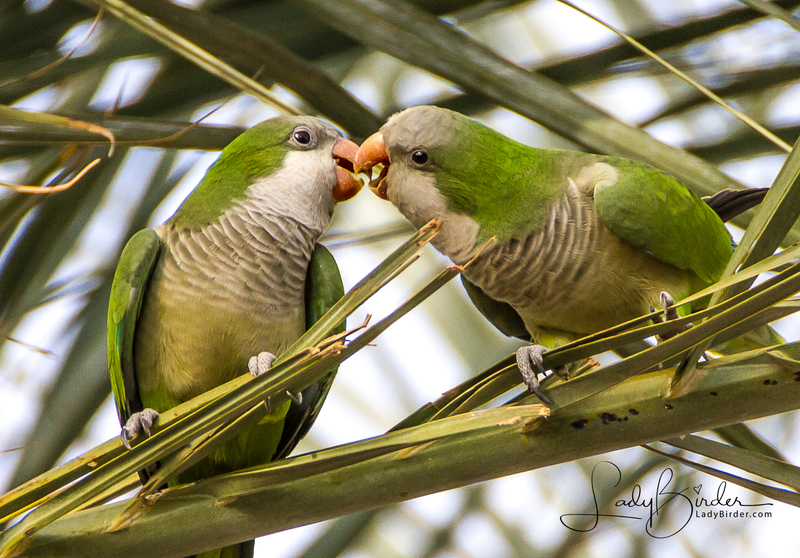 Once the evil Villain is banished, the two Parakeets take a moment to celebrate by laughing, kissing and cuddling before returning to their task of nest building. And that, my friends, is the end to our tale. I just love happy endings, don't you? Such fun re-living the drama. Awesome photos, Lyndie!!! Thanks, Susan. I’m so far behind in posting all the photos from our adventures! The pictures and dialogue on Heroes and villians is wonderful. thanks for sending this to me. I enjoy your birding adventures so much. I can attest to the JFK story concerning the monk parakeets. There is a beautiful park like cemetery in Brooklyn, Greenlawn. Many famous people are buried here. I went there a few years before moving to Arizona and was surprised to see these birds in the trees there. I’m glad that good prevailed! I’ve never seen the parakeets, I guess I should go look for them soon, they’re very cute. Sign me up for your Briding/Travel Blog! New Arrival to the Gift Shop! “Phoenix Rising” can be printed on paper, canvas, note cards, t-shirts, mugs and more. Be sure you’re on my subscriber list so you’ll get notified of when I’ve uploaded pieces. Click here to go to the Gift Shop.